Oracle discovers the animals have “forgotten their names”—the ones Adam gave them in Eden. But Oracle remembers. When others meet him—a wounded butterfly, an angry alligator, ancient trees—Eden’s memory awakens in them.An epic drama is unfolding in the wilds of South Texas, though Man does not yet know. 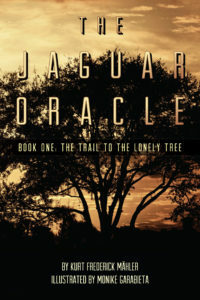 The jaguar named Oracle crosses into the Rio Grande Valley in search of the Lonely Tree, where the last jaguar prayed for a successor before Man killed him seventy springs ago. Oracle befriends Patch, a misunderstood raccoon, and commissions him to help a boy washed ashore after a mysterious accident: Paco, whom the birds name Miracle. Patch persuades Plod the horse and Bog the toad to join him in helping Miracle find his parents. The way to the Lonely Tree is forgotten and dangerous, crisscrossed by ironthorn fences and bands of molten earth now hardened: the realm of Man. What will he do when he discovers Oracle? Can Oracle become the new Lord of the Valley in answer to the last jaguar’s prayer? Find out in this richly poetic tale of friendship, courage, and destiny that will awaken the imagination of children and adults alike. Purchase and post a review of the book at Amazon .